Fig trees are the oldest domesticated crops and have always played an important role in human history. 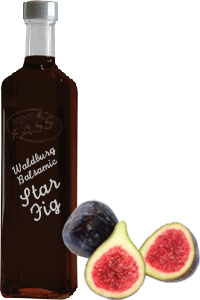 Mostly you get figs today in dried form - all the better that we can offer you a liquid alternative with our fig balsam star. This sweet-sourish creation is well suited for giving a final touch to sauces. Try it in a salad dressing with olive oil or as a special note for desserts. Even with a cheese platter the fig balsam star gives the final touch as a dip.